Powering sleek and lightweight AR glasses, Wikitude will help revolutionize the immersive AR-experience. SAN FRANCISCO, March 22, 2019 – At Game Developers Conference (GDC), Wikitude – the world’s largest independent augmented reality (AR) technology provider, revealed the first steps taken in conjunction with Qualcomm Technologies, Inc to advance immersive AR computing. Wikitude has optimized their AR platform and integrated on XR Viewers powered by Qualcomm® Snapdragon™ 855 Mobile Platform. Extended reality (XR) Viewer devices, announced at Mobile World Congress 2019 combines the compute power of Snapdragon 855 Mobile Platform with the speed of 5G-enabled smartphone provides mobile XR experiences with six degrees of freedom tracking. This integration will help kick start the next generation of immersive AR computing, and this is also applicable to Standalone HMDs enabling users to experience realistic and highly engaging content via XR devices. With Wikitude’s activity growing strongly by more than 7,500 business customers, this will augment the offering to rapidly grow consumer and enterprise user base in AR. The powerful combination of Snapdragon 855 with the Wikitude AR SDK allows real-life walls, floors, and environments to seamlessly blend into the virtual world. 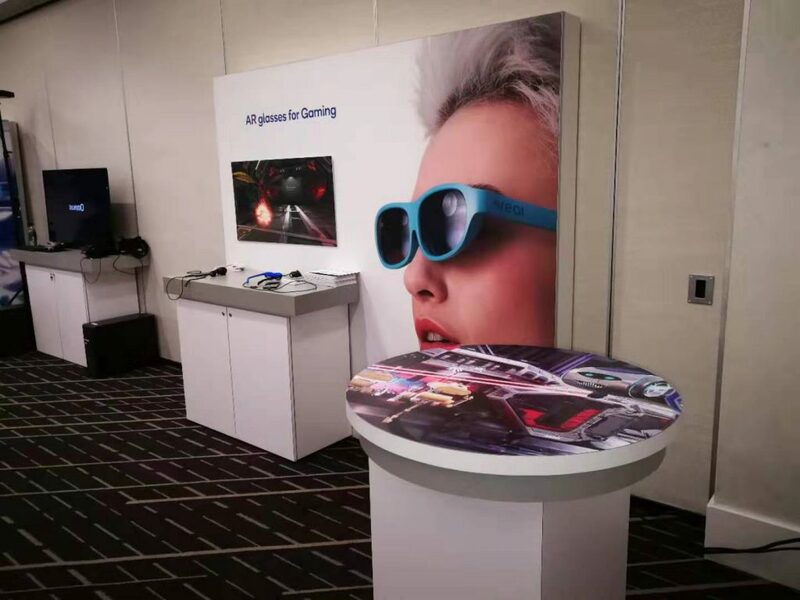 To demonstrate this immersive AR experience, Wikitude invites XR enthusiasts attending GDC to visit Qualcomm’s demo room located at W Hotel from March 21st to March 23rd. The interactive gaming demo uses plane detection on AR smartglasses to simulate the space-ship wall. “This is what Wikitude’s ‘plane detection’ feature does best: it quickly identifies all aspects of an environment and makes devices spacially aware,” says Wikitude CTO Philipp Nagele. Light-weight AR glasses will change the game in the smart glass market. “They are lightweight, more affordable and can be used outside of wifi coverage because the heavy computing part is being handled by XR optimized phones. Adding Wikitude´s powerful augmented reality software to the mix can bring immersive experiences to the next level,” says Martin Herdina, Wikitude CEO. “At Qualcomm Technologies, we believe the Wikitude platform opens new opportunities, for developers to create immersive experiences with features like plane detection, image, object, and scene tracking, all seamlessly integrated and fully optimized for both Standalone HMDs and the next generation of AR devices”. Hiren Bhinde – Director, product management, Qualcomm Technologies, Inc.
Stay tuned for upcoming companies integrating Wikitude’s offering in future demos. Learn more about Wikitude’s technology at www.wikitude.com or by visiting the Qualcomm booth at the upcoming GDC in San Francisco, where the company will be providing demonstrations of its solution in action.